FERDINAND is an animated movie based on the classic short story about a large bull with a loving nature who wants to get out of bullfighting, but is mistaken for a dangerous beast. FERDINAND is a funny, entertaining, well-made movie with some moral, redemptive content but does have some Romantic elements of following your heart. Ferdinand is a young bull who loves gardening. One day he’s going to water his flower, and one of the other bulls, Valiente, threatens to stomp on his flower. Ferdinand tells him he won’t fight, and the other bulls tease him for being a pacifist. Not long after, Ferdinand’s supportive father goes to fight the Matador. Sadly, his dad dies, and Ferdinand is so devastated that he runs away from the bull-training center. After running and running, Ferdinand comes to another town. A little girl, Nina, and her father find him and take him into their home. Lovingly, they raise Ferdinand, who grows to be a huge bull. Nina and Ferdinand do everything together. They grow flowers, run through the fields, even sleep in the same room. Every year, Nina and Ferdinand go to the city center for the flower festival. One year, however, Nina’s father doesn’t want Ferdinand to go, thinking he’s too big and would scare the townspeople, but Ferdinand loves the flower festival too much not to go and rushes after them. When he arrives, he gets stung by a bee and ends up destroying the entire town center. Because of this, they lock Ferdinand up and take him away, leaving Nina in tears. Ferdinand is taken back to the same place he escaped, the bullfighting training center. Will Ferdinand be able to get out again, or will he have to fight like a bull? FERDINAND is a very well made, entertaining movie with a compelling, heartwarming story. The voices and characters are often hilarious. FERDINAND is one of the best-made animated movies of 2017. FERDINAND has a mixed pagan worldview containing strong Romantic elements combined with strong moral, light redemptive elements. Ferdinand makes sacrifices for others while loving and caring for them. However, the movie stresses doing what you want, following your heart and going against the grain. This message, and the message of anti-bullying and pacifism, is a very current message of our time. Despite this, God has created each individual in His image with purpose and fulfillment in Him, rather than following our own desires. Strong moral worldview about love triumphing over hate with redemptive elements of sacrifice and helping others in a caring and loving nature and positive, although funny representations of nuns calling upon God and making the sign of the Cross as well as light mixed pagan content with strong Romantic elements stressing following your heart and doing what you want along with a light politically correct content. Goat gets kicked around and sat on, things get smashed, and bull gets scraped by a sword. FERDINAND is an animated movie based on the classic short story. Ferdinand is born in a bullfighting facility, where his father trains. One day Ferdinand sees that his father doesn’t return from the bullfighting ring and realizes he never will return. Ferdinand is crushed and runs away. He finds a loving home with a little girl named Nina who becomes his best friend. Years later, Ferdinand grows up to be a huge bull and goes to the city center for the flower festival. Ferdinand ends up destroying the town after getting stung by a bee. Mistaken for a dangerous beast, he’s taken back to the bullfighting ring. Will he ever get out of fighting for a living? 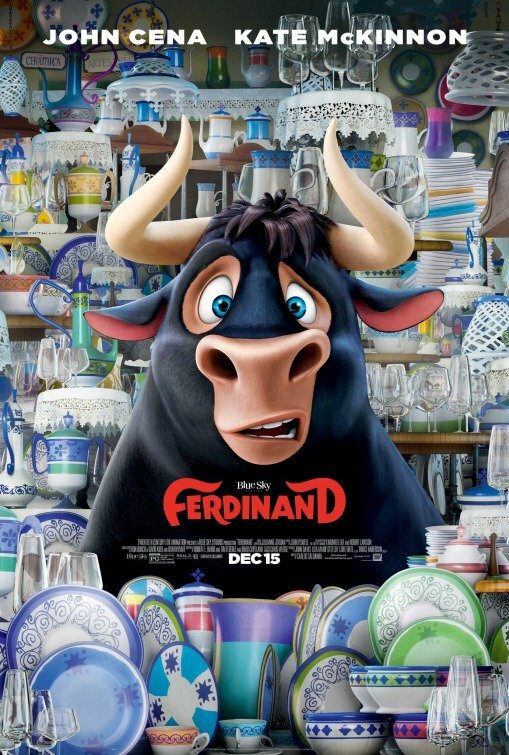 FERDINAND is a very well made, funny, entertaining movie with a captivating, heartwarming storyline. The voices and characters are often hilarious. However, the movie has a light mixed worldview. For example, strong Romantic elements stress following your heart and opposes bullying, but strong moral, redemptive elements show Ferdinand sacrificing for others while loving and caring for them. MOVIEGUIDE® advises caution for young children for FERDINAND.